John Maus - We Must Become the Pitiless Censors of Ourselves. Vinyl LP. Bleep. 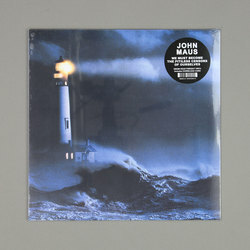 We Must Become The Pitiless Censors Of Ourselves' is the third solo album by John Maus, and the most accessible to date. After working alongside Gary War and Ariel Pink in Haunted Graffiti, Maus released his debut album in 2006, a masterpiece of lo-fi bedroom pop crafted lovingly in his home over 5 years. Another 5 years on, with the excellent 'Love is Real' in between, Maus has further evolved these home-made hits into perfectly crafted pop songs. Shimmering synths and electronic drum kits accompany his sombre baritone, with every song heavy with nostalgia, looking towards the future while carrying with it the sonic palette of the past. Tracks like 'Hey Moon' featuring guest vocalist Molly Nilsson, is stripped back in its arrangement, their vocals drenched in reverb sing their loving duet, accompanied by an unadorned piano arpeggio and a simple drum beat, creating a lullaby for a future world. Like every Maus album there is a sing-a-long anthem hit, and 'Cop Killer' fulfills this role, showing his genius and dark and twisted humour, (he is a lecturer in Philosophy after all), while 'Believer' is brilliantly garish with its synth and church organ, making an epic and evocative track bringing the audience back to the time of VHS haze. This is an album that sits between being great pop music and experimental noise, evoking the dystopic future and the analogue past, while blurring the boundaries between the familiar and the absurd.